The latest publication (Vol. 15 No.3 2006) from the Business and Economic Research Center (BERC) at the Middle Tennessee State University features an excellent article by Dr. Richard W. Oliver and Ed Sperling on the growing influence of nanotechnology and some updated graphics that wouldn’t have come out as well as they did without NanoEngineer-1. Click on the pdf, which’ll open a linked Table of Contents to the whole article. I’m not much for presenting critical discussions of content (that whole “spare time” thing), so will keep it brief. It is a very good, non-technical (well, non-technical to ME anyway) discussion of how our continued understanding of the nanoscale is shaping developments in all industries. While some general science is intermixed throughout, the focus of the article is on the shaping of economies, or how the current nanotech weather will eventually become the eye of the storm of the global manufacturing climate. I tend to not look far beyond my own computer screen as I push ahead in the field, so I very much enjoy reading coherent presentations of nanotech aspects I wouldn’t otherwise spend much time thinking about (yes, there are many in nanotechnology wondering IF we should, HOW we should, WHEN we should, WHAT we should and WHY we should, and many of those in the field have orthogonal interests that could all benefit from larger coefficients in their off-diagonal elements). That’s what makes David Berube’s Nano-Hype so interesting to read and Rob Tow so interesting to listen to. And it wouldn’t be a Tennessee nanotechnology article without some mention of Battelle, the current managing organization for Oak Ridge National Lab and other driving force, along with Foresight Nanotech Institute, of the Technology Roadmap for Productive Nanosystems. [Slipping into terminal blog mode for a moment] This past week saw (1) the second Technology Roadmap for Productive Nanosystems meeting at Brookhaven National Labs and the press release for (2) Nanorex’s first major educational outreach project as part of (3) the COSMOS (California State Summer School for Mathematics and Science) summer program. 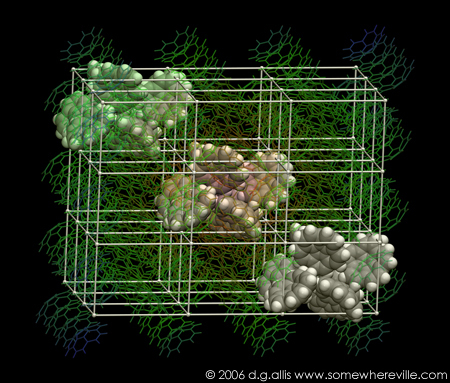 The purpose of (1) is to develop science and technology pathways with the intent of realizing the full potential of molecular nanotechnology, the purpose of (2) is to enable researchers, like myself, to have the best possible tools for designing molecules and nanosystems in order to go into experimental work with the most complete understanding of their properties, and the purpose of (3) is to make sure that we (that’s the world) will have researchers in the future capable of making it all happen (and, in case you’ve not been following the news, we need all the help we can get in the sciences). The next major update to NanoEngineer-1 includes all of the force field parameters required to simulate carbon nanotubes and other structures with extended pi-systems. In anticipation, I began sorting through some very old designs of mine that I promised to revisit once computers and software became useful enough to allow for their simulation. Fortunately, the state of technology has moved faster than Barnard’s Star, so the old designs are rapidly being overwritten with new ideas. As for the gallery timing, I just completed some rerendering of gallery images for an upcoming article I’ll link to when it’s available, part of my work on the roadmap involves addressing steps to go from current technologies to motifs described in the new images, and, of course, Christine Peterson was kind enough to link to me in a recent nanodot post and I abhor the idea of having all the same old images up in the event anyone ever links to me again. 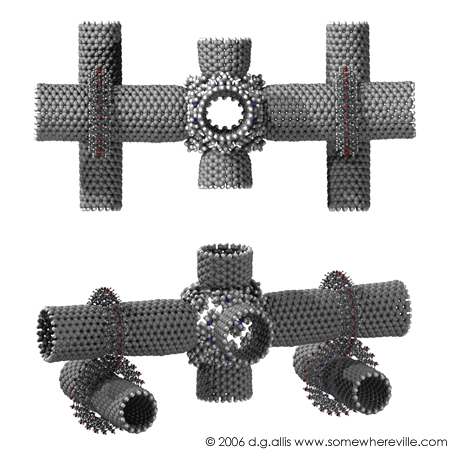 The first image is of a non-covalent nanotube junction assembly that I first presented back in 2002 at the Foresight Institute 10th Conference on Molecular Nanotech. The design uses tapered nanotubes of identical radius and chirality (two things we can’t do yet in the lab, although you can buy the bulk products), molecular hinges composed of molecular fragments containing dative/dipolar bond donors and acceptors (which I presented with references and price lists for the components), and the MM2 force field with added terms used to model the dative interactions (which is older than I am and trusted to get the overall structures correct in this context). The goal was to design an octahedral junction that would, under ideal conditions, self-assemble. This structure just about maxed out the machine I had available at the time, but is now a 20 minute job to clean-up. 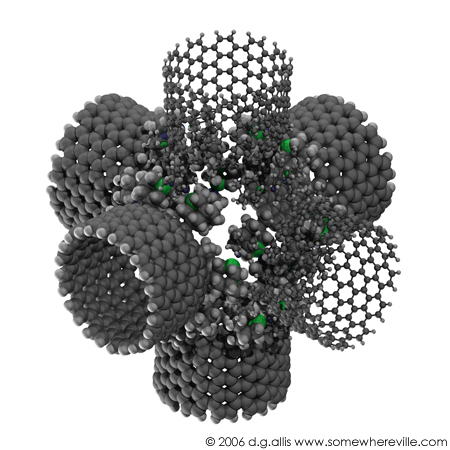 The second design is a network incorporating both the dative junction assembly above and my ever-so-popular fused diamondoid carbon nanotube van der Waals crimp junction. The purpose of this design was to demonstrate a number of structural motifs in as small/model-able a system as possible for part of my Brookhaven TRPN talk. In order to show the detail in this structure, you can click on this image to see a larger version. While I don’t wish to engage in a conformational entropy debate at the moment, I was pleased to include in the presentation of this structure a recent JACS paper out of Prof. Alex Zettl’s lab concerning nanotube solvation and nanotube/protein coupling. Taking a step back to the present, the last image is the crystal cell of corannulene, the subject of a submitted article on solid-state DFT and crystal geometry prediction/interpretation. Not really nanotech, but these are pi-systems (sticking with a theme) and the image came out nicely after some tweaking. I will save the thorough explanation for if/when the article gets accepted. Yes, yes, I know. After all, I do work for the company. Why WOULDN’T I use the program?! The development of nanoENGINEER-1 is going tremendously well. Now on the verge of another alpha release, I decided, in the interest of seeing what kind of imagery functionality the package might benefit from, to see if I could make the old Nanotech Gallery happen with the new software. I could not be happier with the results. The problems to date are all with Povray. That is, my amateur understanding of it. As an order of alignment, I was doing all of my graphic work with VMD, which is still the method of choice for biomolecular images (mostly because I’m still using NAMD/Charmm for my occasional forays into drug development). It’s a tall order to replicate the quality of graphics VMD is capable of, but it’s clear (to me, anyway) that nE-1 is more than up to the challenge.